NIA CHARLESTOWN NEVIS (August 21, 2014) — Premier of Nevis Hon. 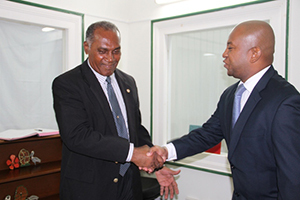 Vance Amory, welcomed new resident Organisation of American States (OAS) Ambassador to St. Kitts and Nevis His Excellency Terence Raymond Craig, when he paid a courtesy call to his Bath Plain office on August 21, 2014. In brief remarks at the end of a meeting with Mr. Craig, who is a national of Suriname, Mr. Amory gave some insight into their discussions. “We have had a brief meeting on how the OAS, through his instrumentality, could continue to help St. Kitts and Nevis but in this case, specifically Nevis. His Excellency has assured me that he would be willing, through his office, to provide such assistance as he is able to do, to ensure that Nevis continues to benefit from the efforts of the OAS. “Some of the areas we talked about are training, education and I am looking at youth development [and] how could we utilise the skills and resources which could be mobilised to provide some entrepreneurial development or skills development for our young people. I think that is an important area and the Ambassador and myself would be talking more about that as time goes on,” he said. 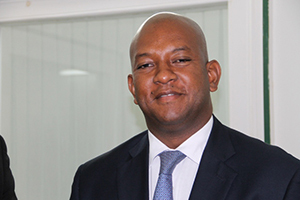 Meantime, Ambassador Craig who had arrived in the Federation last week, though his appointment to the Federation commenced on July 01, 2014, noted that he was pleased to be on Nevis and acknowledged discussions with Premier Amory. “It’s a pleasure for me to be here in Nevis. We have exchanged some ideas how to advance the work of the OAS in the near future, to the benefit of the people of Nevis and we are going to work on that as well, in the future, during my tenure here,” he said. The OAS Ambassador further explained that his organization was in the process of creating an avenue through which member states could receive assistance. “At the OAS, right now, we are creating a development fund for all the member states. Out of that development fund, member states will get assistance. Member states of course would have to put in the seed money in this fund. “Right now, we are looking at all the national development plans of the member states to identify the priority areas. Hopefully, by next year we will be ready to give some assistance,” he said. Mr. Craig replaced Ambassador Starret Greene, who was reposted to Belize at the end of June.